Shops : Park Place Jewelers, Signatures Boutique and Bally's Avenue Shoppes. Address: 3645 S. Las Vegas Blvd. Restaurants : Chang's (chinese restaurant), Bally's Steakhouse, Sidewalk Café, al Dente, Sterling Brunch, Terrace Café and The Big Kitchen Buffet, Johnny's Delicatessen, Ichiban. Standard room amenities : cable TV, AC, electronic door locks, in-room safe, iron, PPV movies, telephone with voice mail. Hotel amenities : Concierge, laundry, maid service, safety deposit box, tennis courts and swimming pools, currency exchange office. Located in the middle of the action on the Las Vegas Strip, Bally's Las Vegas a little bit of everything Vegas, with a classic showgirl revue, gourmet restaurants, a popular spa and comfortable rooms. 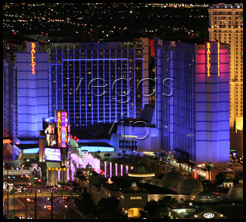 It is known endearingly as classic Vegas mixed with contemporary. From the moment guests enter the outdoor plaza, lit neon blue with a tunnel-like entryway and emphasized by fountains on each side, guests will get that special 'getaway' feeling as they walk into a bustling 67,000 square-foot casino. With dining options to match, including Bally’s Steakhouse and Chang’s Chinese restaurant, there is not much necessity for leaving anytime soon. Bally's other amenities are plentiful. Three showrooms host a wide scope of entertainment, from headliners to the lavish cabaret show Jubilee! A modern gymnasium and spa offer everything from weights to a full sauna.